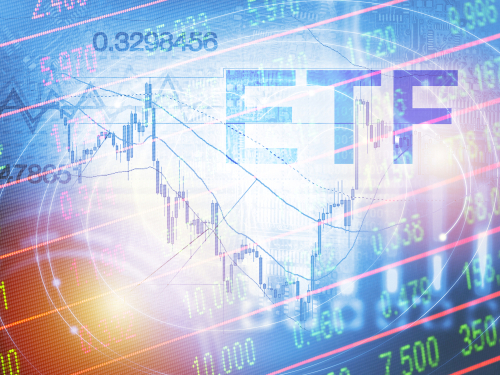 A recent paper concludes that the price volatility of individual stocks held widely by passive exchange-traded funds has increased with the popularity of ETFs. TABB Group’s head of derivatives Russell Rhoads examines what it means for investors. The first article in the most recent issue of the Journal of Finance, “Do ETFs Increase Volatility?” immediately caught my attention, as exchange-traded funds and market volatility are two of my favorite financial market topics. The specific question addressed in the article is if individual stocks now experience higher price volatility due to arbitrage trading between ETFs and the shares that are held by the funds. In 2000, 0.14% of the market capitalization of the S&P 500 was held by passive exchange-traded funds. By 2015, the latest data cited in the paper, this figure had grown to 7.05%. For the members of the Russell 3000, this figure grew from 0.12% in 2000 to 7.48% by 2015. TABB Group estimates that by late 2018, $5 trillion was invested globally with exchange-traded products, up from about $3 trillion at the end of 2015. It may be assumed that the dramatic increase in assets held by exchange-traded products over the past three years should exacerbate any findings in the study, which used data ending in 2015. The price of an ETF and the actual net asset value (NAV) of the fund will diverge over the course of a trading day. What keeps this divergence from widening too much is a potential arbitrage play that institutions can execute. A brief and high-level example of how this sort of arbitrage trade comes about appears on the table below. In order to fully participate in the following example, institutions need to be what is referred to as an “authorized participant” that often is acting as a market marker or specialist in shares on the ETF. The trades described above both have the trading firm exiting through the creation or redemption process. However, it is also possible for the firm to exit the trade by taking an offsetting position. For example, if the NAV is lower than the market price of the ETF early in the trading day, a firm may buy the basket of underlying stocks and short the ETF. If later in the trading day, however, the NAV rises to enough of a premium to justify a trade, the firm may buy to cover its short ETF position and sell the basket of stocks it had purchased earlier in the trading day. It is important to note that both transactions result in trades in the shares of the underlying stock that are not motivated by a fundamental outlook on the individual stocks; rather, the trades are executed to make a short-term profit. The major hypothesis in the paper explores whether stocks that are widely held in ETF portfolios experience increased price volatility based on the cross trading that occurs when the NAV and market price of an ETF deviate enough to create an arbitrage trading opportunity. Usually, when we think of an increase in market activity, we automatically equate the higher volume with more liquidity, which should result in lower volatility. The authors in this paper make an argument that liquidity seekers, such as the traders engaging in the sort of activity described above, actually heighten the volatility of the stocks involved in this arbitrage trading. At a high level, the finding of the paper is that the price volatility of stocks held widely by passive ETFs has increased with the popularity of these trading products. But the authors also mention that there are benefits for investors due to the proliferation of exchange-traded funds, with a major benefit being low-cost diversification for individual investors. The bottom line: Individual stocks may now be more volatile due to ETF arbitrage trading, but that extra volatility is well worth the benefits of the growing exchange-traded fund portfolio of the financial marketplace. An abstract of the article, “Do ETFs Increase Volatility?” can be found here.